Meredith NH is on the northwest end of Lake Winnipesaukee. It is a quaint town with several attractions. You'll find it has a home town feel with many shops overlooking Lake Winnipesaukee in New Hampshire. This town is in the heart of the lakes region and a favorite place to visit among the tourists. There is plenty to do while on vacation. There are many restaurants to choose from whether you want fine dining or something the whole family can enjoy. Meredith NH is a place that you'll want to stop at on your way to the White Mountains or if you're just driving around the lake. Its a great destination spot when you're out cruising the lake in your boat. This town has so much to offer, that you'll never get bored. If you're looking for fine evening entertainment, then hop on over to the Winnipesaukee Playhouse. This organization produces community based productions with Off-Broadway style theater in the heart of New Hampshire. There's something for everyone whether you want to be onstage, behind-the-scenes or in the audience. Read Reviews about the Meredith area. It was first named Palmer's Town in honor of Samuel Palmer who surveyed much of Lake Winnipesaukee in New Hampshire. Later, the name was changed to New Salem as many settlers came from Salem, Massachusetts. In 1768, the town was again renamed to Meredith after Sir William Meredith who opposed taxation on the colonies. You'll find this town has a unique appeal. There are many antique shops, classy restaurants and little boutiques. Sitting along the shore eating an ice cream is one way to take in the beauty of the area. Browsing through the shops looking at unique items gives you a down-to-earth feeling. 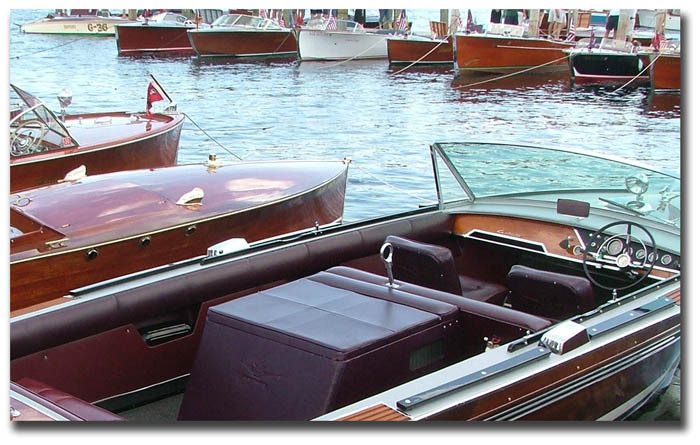 One of the things we like to do is go to the antique and classic boat show. It used to be held at Weirs Beach, but moved over to the town docks in Meredith NH. There is limited docking, so it's probably best to go by car. It's really something to see the older boats that cruised Lake Winnipesaukee in New Hampshire. For some, it brings back memories, for others it brings inspiration. You can sign your kids up for sailing lessons at Meredith Bay Sailing Association. They learn the basic skills and have a blast while their at it. During June, Laconia Bike Week has quite a bit happening in Meredith. Harley-Davidson is the place to be at that time. 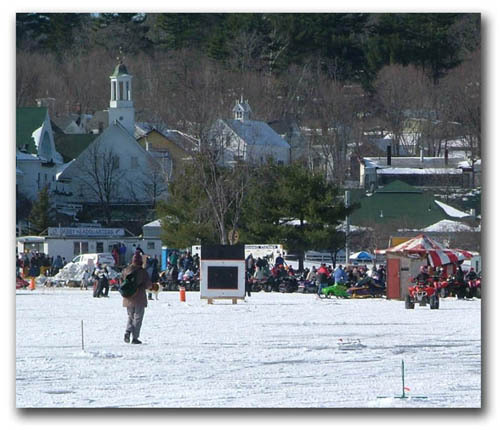 If you're into ice fishing, then you'll like going to the great Rotary Ice Fishing Derby. This is held in February. It's like a little town out there on Meredith Bay. Even if you don't fish, it's fun. People come by car, snowmobiles, sea planes and ATVs. There are concession stands, contests, cross-country skiing, a separate area for ice skating and the local shops and restaurants are open for all to enjoy. For even more outdoor fun, you can watch the New England Pond Hockey Classic on Meredith Bay. This is usually held before the fishing derby.